A van that was used to haul out debris from the University of Hawaii-Manoa press building remained parked and unused on Wednesday. The vehicle was tested positive for traces of asbestos by the UH Environmental Health and Safety Office. ASBESTOS and other hazardous materials were improperly thrown away in trash bins all over the University of Hawaii-Manoa campus after a cleanup project went awry, officials said. An outside firm is expected to remove the asbestos from a van parked outside the student newspaper press offices today and check the press building for more asbestos, said Roy Takekawa, director of the university's Environmental Health and Safety office. The van had been cordoned off with yellow tape since the hazardous materials were discovered on Monday. Student members of the Board of Publications had been cleaning out the press building on Sundays since Nov. 6, said Ross Kamakahi, a Board of Publications member who headed the cleanup effort. The material was mostly scrap metal, Kamakahi said. But ink, paint and other materials that had not been used in years were also cleared to free up more space in the building. The materials were put in the van and driven to other trash bins around campus because nearby bins had been filled up, Kamakahi said. The UH environmental safety office discovered the dumping after they were called after a white powdery substance was found in the van and after a disposal company discovered other materials in a container reserved for food waste. "It's not like lab chemical waste," Takekawa said. But, he added, "in this day and age, you just can't take an old can of paint and throw it in the dumpster." 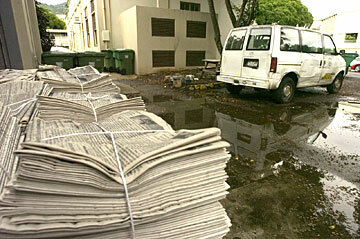 Kamakahi said the cleanup of the building where the student newspaper Ka Leo O Hawaii is printed will continue. But he will be working with the environmental safety office to properly dispose of old press machines that could contain asbestos. The cleanup of the van is expected to cost about $1,000, Takekawa said. The cleanup crew also broke a water pipe on Sunday, which prevented Ka Leo from being printed on Monday.